One hundred artists, 100 blank canvases and a whole lot of creativity. 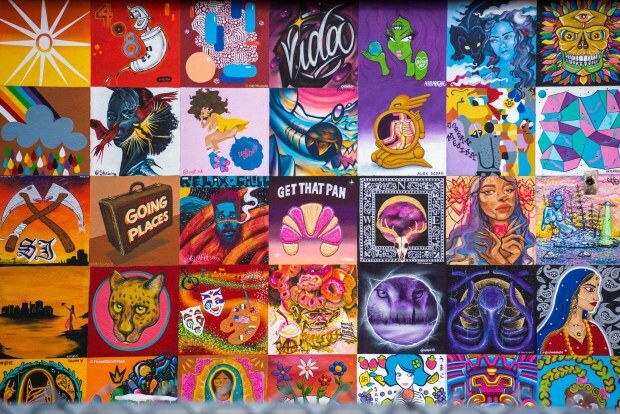 In an effort to beautify the streets of downtown San Jose, local nonprofit arts organization Exhibition District brought together artists for the 100 Block San Jose project. 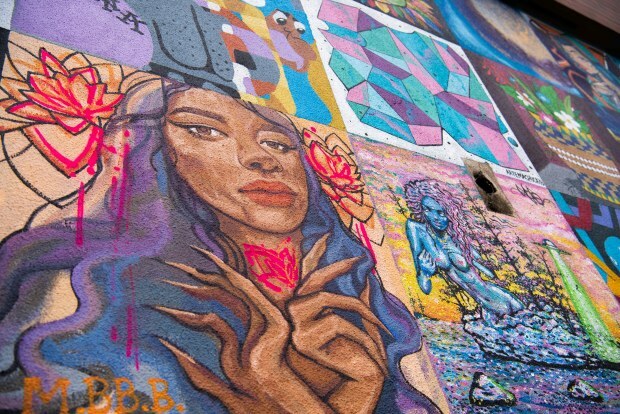 "Typically, murals are done with one lead artist and a handful or several volunteers," said Exhibition District Operations Director, Ellina Yin. "The inspiration was to flip it to a smaller scale. 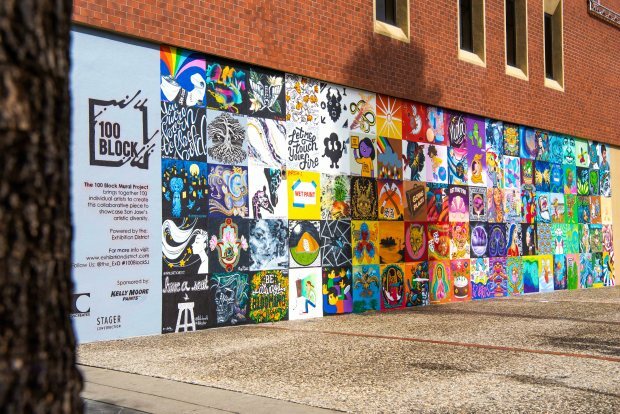 Have a 100 lead artists on their own mini-mural, collectively painted together to make a large collaborative mural of 100 awes." The artist selection process started last year after the organization made a call for artists on social media through the Local Color arts collective. Once the artists were selected, they were given a 3-by-3-foot canvas to fill with their creativity, resulting in a 900-square-foot mural. Besides getting the chance to have their work featured in a public space, the project was able to pay each artist for their respective works. According to the organization, 90 percent of the artists are local, with 40 percent identifying as female, 50 percent as male and 10 percent as non-binary. Viewers will find a wide range of artistic pieces from portraits to community activism. Once complete, the project could become a Guinness World Record for collaborative murals. The organizers are still in the process of applying for the world record but have not yet been confirmed. According to Yin, it could be anywhere between 4 and 6 months before it's approved. When we asked Yin if San Jose can expect more collaborative murals like this in the future, she said, "Yes! The more color the better! Not only does it show a place is cared for and loved, it really lights up space, makes you slow down and just absorb the moment." The art installation will be unveiled to the public on Friday, March 1. But if you miss the event, you can find the art installation at 300 First St., across from the California Theatre in San Jose. CORRECTION (Feb. 28, 2019 10:00 a.m.): A previous version of this story stated the mural was a Guinness World Record holder, but it is not. The mural is in the beginning stages of filing for the record-breaking title.